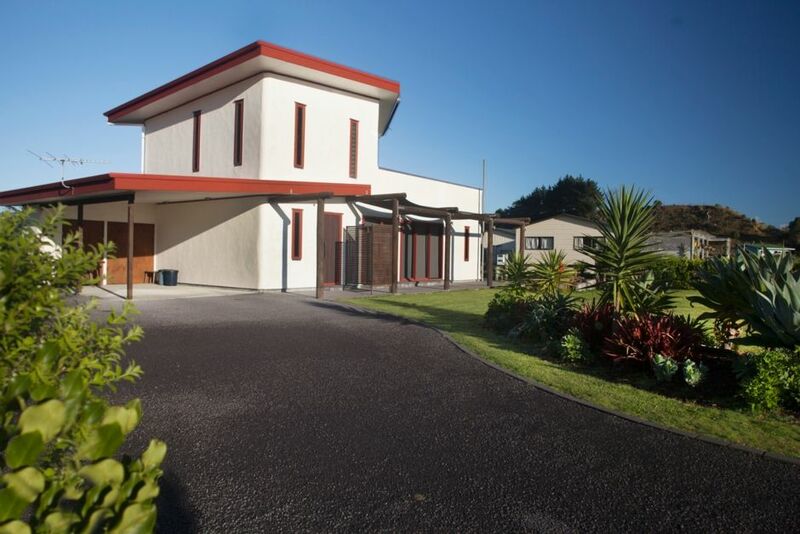 This spacious, light filled home - only 90 minutes easy drive from central Auckland - has been lovingly built with comfort in mind. It is the perfect location for friends or extended family wishing to holiday together as the open plan upstairs level is completely self contained, with its own kitchenette, fridge and bathroom. Large ranchsliders open up the home to the outdoors from all the living areas and downstairs bedrooms. There is a fabulous, roomy upstairs deck for enjoying long summer evenings over a bottle of wine (or two). Enjoy a BBQ downstairs, watching the magical sunsets over the expansive fenced lake at the bottom of the garden. The section is large and flat, ideal for kids to safely burn off excess energy while the adults kick back and relax. Superb indoor / outdoor living with our own unique garden furniture provided. This location is a virtually undiscovered gem. The beach is uncrowded and at low tide there are leisurely walks to neighbouring bays to be savoured, exploring rock pools and watching the shorebirds as they fish at water's edge. Bring your boat and fishing rods and launch from the beach (tractor arranged on request). Or walk east round the bay and fish from the rocks. Within a 20 minute drive you can experience the wild surf pounding on the majestic Tasman west coast, or travel east to the historic Brooks homestead, gentle wetlands and rare bird life of the Awhitu Regional Park (you can even play a game of 9-hole golf while you're there). Or journey to the top of the Peninsula and experience some of the most stunning views in Auckland from from the ancient lighthouse overlooking the treacherous Manukau Bar. A compulsory bond will apply per our terms and conditions, calculated on number of guests and length of stay. One night stays available at owners descretion. - Smoking allowed only outside. - No tents on the back lawn due to irrigation field. - Careful use of tank water would be appreciated. Off street parking for 4 cars. Please no parking on the grass areas. Salt & Pepper, tea, coffee, sugar and the odd item left by other renters. Our community has tennis courts beside our local community hall 15 minutes walk up the road. We book this property to attend a friends wedding and it was perfect. We really enjoyed what time we did spend here. Joanne has been amazing to deal with and if we were to head out this way again we would not hesitate to book this property again. Nice property. Tidy, modern & spacious. Everything that you mite need and more. Lots of cutlery & utensils. Friendly, helpful owners. Friendly chatty locals. Quiet picturesque community. Handy to beach access & boat ramp. Great place for a relaxing holiday or break. Lovely property. Great location on fantastic beach. The house remains one of my favourite places to escape to! Great location, very tidy and comfortable house. Well equipped with everything you need on a weekend away. Look forward to visiting again.